When I was very young, movie watching was always paired with air-popped popcorn topped with some melted butter and salt. As I got older, the air popper was replaced with microwave popcorn. I've become less of a fan of the microwaved kind since I've heard that packaged microwave popcorn gives off a toxic gas when it's cooked and certain chemicals found in microwave popcorn may actually interfere with a vaccine's effectiveness! I'm not an “all organic” type of mom, and I'm not about to overhaul our eating habits and lifestyle. At the same time, I don't mind making simple changes or finding alternate, safer methods to prepare food that my family likes. I only recently learned that it's insanely easy to make real popcorn in the microwave. Like, just as easy as opening up and unfolding a package of the prepared stuff. I haven't done any sort of cost analysis on it, but I know that this method is also far cheaper than packaged microwave popcorn! 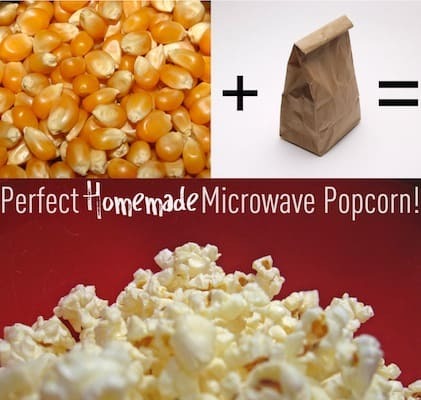 Dump the popcorn into a brown paper lunch sack and top with the oil and salt. Fold the top of the bag over twice, then shake it to coat the kernels with the oil and salt. Place the bag on a plate or a paper towel, then microwave it on high for 2-3 minutes. Listen to the popcorn pop. Stop the microwave when you hear 4-5 seconds between kernels popping. *The oil is optional, but it makes for better flavor and texture. When the popcorn is done, the bag will have some oil reside on the outside, so it's best to pour it into a bowl to eat it. Top with butter, if desired. 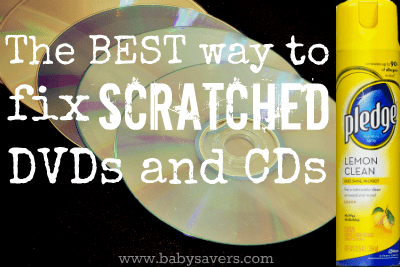 Improve your movie night: Take a look at the best way to repair scratched DVDs (and CDs)! I love this idea! I bet it tastes so much better than that prepackaged stuff! Thanks so much for sharing! YUM! Thanks so much for sharing this. Can’t wait to try it. What a great idea! Thanks MaryBeth! I am a huge popcorn fan. It always felt like there could be something not so healthy about the purchased type microwave popcorn. Now I am anxious to give this healthier choice a try.